TRIVIA of Noh : Q27 :What kind of hair is used on noh masks? | Home | Trivia | Q27 : What kind of hair is used on noh masks? What kind of hair is used on noh masks? 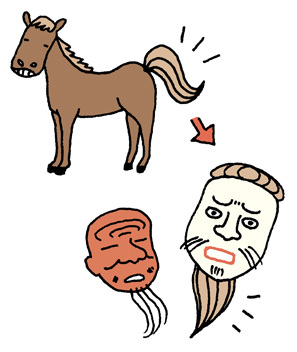 Horsehair is used on Noh masks for both head and facial hair. Hair from the mane is used for short strands, and horsetail hair is used for long strands. Horsetail hair is quite elastic and is also used to make brushes. Masks of men and demonic gods have hair on the head, mustache, and eyebrows, whereas strands of hair on female masks are drawn in ink. A wig is worn when a performer dons a female mask. Interestingly enough, this wig is also made from horsehair. Wigs are not tailor-made for each performer. Instead, a decorative wig band called basu is wound around the head. Originally human hair was used; however, it is replaced by the horsehair today because human hair is difficult to take care of.